When Jodie Foster won the Cecil B. DeMille award at last year’s Golden Globes (video of that is below), she gave a lovely if rambling acceptance speech that for all practical purposes served as her official coming-out. Afterwards, most people were all “that’s nice dear, please pass the salt,” while others insisted the rest of us were reading way too much into it and that just because a woman everyone already knew was gay pretty much said so on national television, she didn’t explicitly say it so HEY LIBERALS STOP TRYING TO MAKE EVERYONE GAY. But now Foster’s rep has confirmed that Jodie and her girlfriend of nearly a year, actress and photographer Alexandra Hedison, wifed-up and tied the knot this weekend. THANKS OBAMA. Hedison’s acting credits include three seasons as Dylan Moreland on the Showtime series “The L Word,” and her personal resume includes a three-year stint as Ellen DeGeneres‘ girlfriend (they split way back in 2004). As for Jodie, she’s been single since 2008, when she and her partner of 20 years, Cydney Bernard — affectionately mentioned in her Globes speech — parted ways after having two kids together. No word on whether the bride(s) wore white or who was there or even where the nuptials took place. 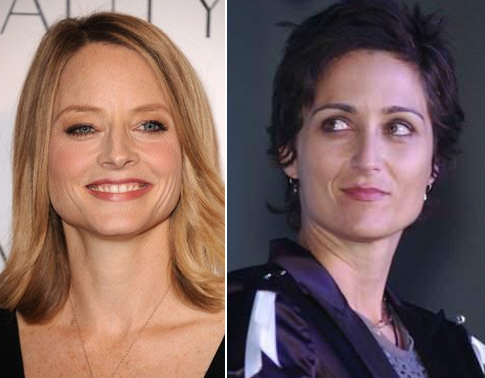 But unless you think she’s been forced into marriage by Beyonce and Jay-Z and the rest of the Illuminati, the whole “is Jodie Foster really gay” question has probably now been settled once and for all. Well played, Jodie. Well played. LOL on that last quote! Congratulations & best wishes to the happy couple.